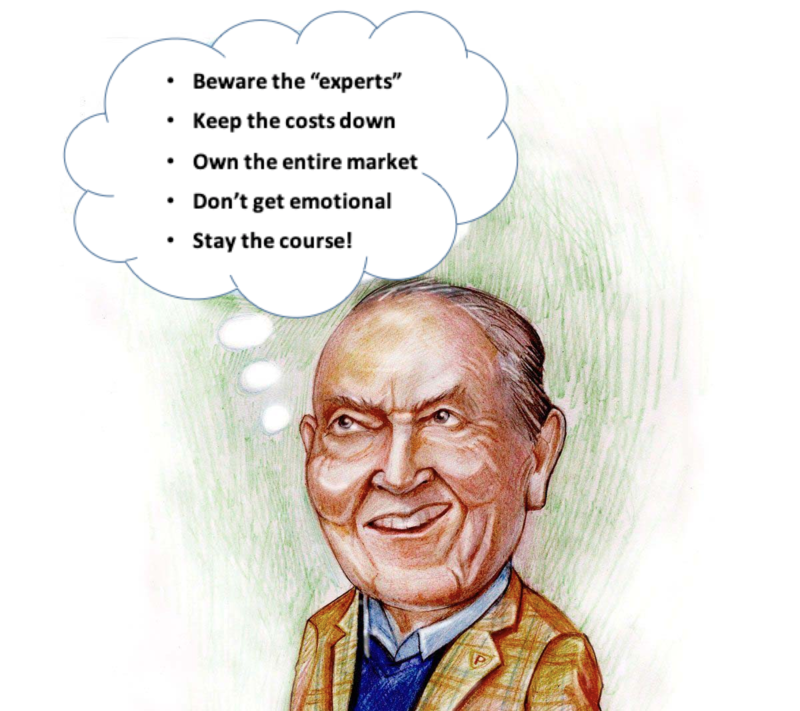 You are probably not alone if you have never heard of Jack Bogle. However, he most likely impacted your important long-term investment nest-eggs like retirement accounts and college savings more than anyone else besides you. Jack Bogle started the Vanguard Group in 1975 with the singular idea of the index fund which provides broad stock market exposure and aims to match the return of the market with low operating expenses by avoiding expensive methods like stock picking and market bets. This idea would eventually turn the investing world upside down for the benefit of the average investor. In 1975, the first year that Bogle’s index fund launched, it collected a mere $11 million of assets. Today, Vanguard has 190 funds and $5.3 TRILLION in assets under management at an average fund expense ratio of 0.11%. When comparing that average fund expense of 0.11% with actively managed funds that often charge fund expense ratios topping 1.00%, you can easily understand Bogle’s positive impact on investor fund returns and account balances over time. 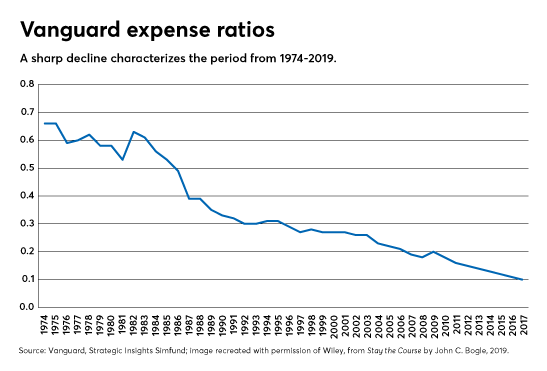 The chart below shows the consistent and dramatic decline of Vanguard fund expenses since Vanguard’s founding which has directly translated into greater compounding wealth for Vanguard funds owners. Another revolutionary idea by Bogle was that he set up Vanguard as client-owned. In this very unique structure, the company is owned by the Vanguard fund shareholders, which in turn own Vanguard. 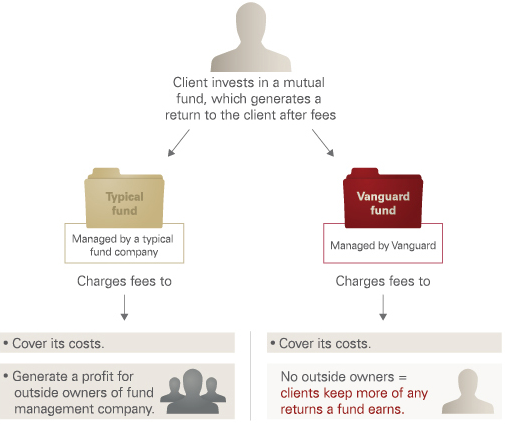 Yes, if you own a Vanguard fund, you therefore own part of The Vanguard Group! Therefore, as Vanguard fund assets under management grow, the expenses that are charged go lower and lower over time. Another upshot of Bogle’s brilliant idea is that it prevents Vanguard from having to increase fees to chase outside shareholders’ profit expectations. Bogle certainly had his critics especially from the more expensive active fund management industry. In fact, some of his critics claimed that his indexing philosophy was “un-American” since it was a sure way to achieve mediocrity. 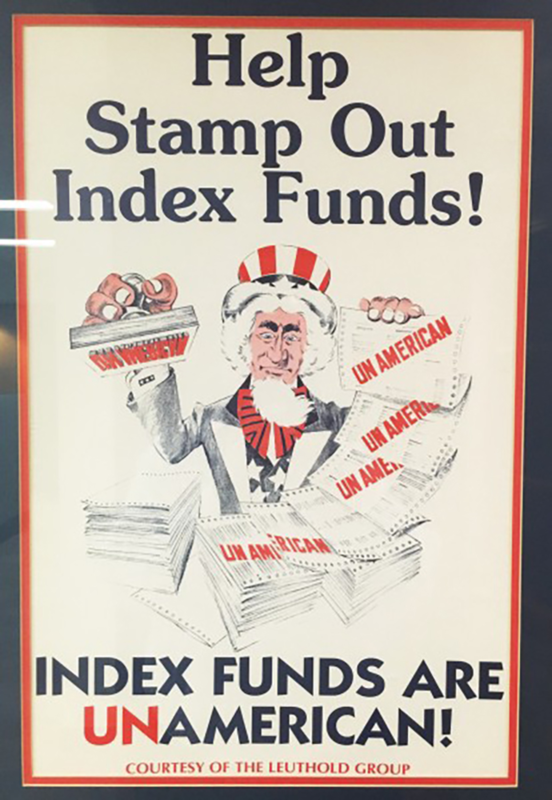 The poster below was distributed by a financial research firm to Wall Street clients soon after the launch of the low-cost index fund 40 years ago. Of all the investable assets under management, approximately 22% are invested in index funds and ETFs.1 That translates to approximately $17 trillion of assets. By comparing a 1.00% management fee for a traditional mutual fund with the 0.11% average expense ratio that Vanguard charges, that equates to Bogle’s indexing revolution saving investors $155 billion A YEAR. Every year, year after year. That’s a lot more money compounding higher in 401ks, IRAs, and 529 college plans, helping people grow investment nest eggs to purchase a home, pay for college education or live a more comfortable retirement. That is certainly not un-American in my view. Jack Bogle was the people’s investor and whether you invest with Vanguard or not, we are all better off as investors today and tomorrow because of him. 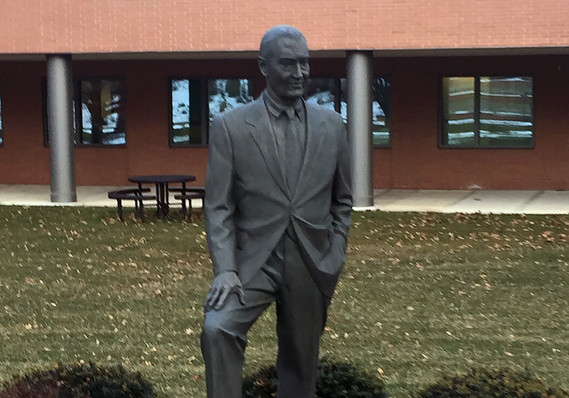 He was always reminding us that investors are “honest-to-God, down-to-earth, human beings, each with their own hopes, fears and financial goals.” Over the course of history, no one has given more to investors and taken less in return than Jack Bogle.